A medical student who came to the aid of a man on a train has been tracked down after an online plea to find her. 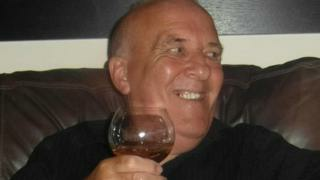 David Murray, 75, who was diagnosed with Parkinson's disease in 2007, was left "completely frozen" on the train in Cardiff when his medication failed. Oxford University medical student Rebecca te Water Naude stepped in to help. Mr Murray launched a Twitter plea to find Ms te Water Naude which was retweeted more than 28,000 times. Ms te Water Naude, who competed in the 2017 Boat Race, told the university her intervention "was just the natural thing to do". She said: "When I saw the tweet I was mostly just pleased to hear he got home safely." She added: "When I saw David he was standing up, frozen, just a few minutes away from Cardiff where I was getting off so I asked him if he was OK.
"He told me he had Parkinson's and his medication had stopped working, so I offered to help him get off the train. "We chatted about what he had been up to and I told him as a medical student, I was interested in Parkinson's. "When the train stopped I helped him get onto the platform, where we asked the station staff for a wheelchair so he could go and meet his wife." Retired Age Concern executive and father-of-six Mr Murray took to Twitter afterwards because he wanted to thank Ms te Water Naude, and the university stepped in to help with the search. He later tweeted: "My wife and I are so grateful even though Rebecca, to her credit, is modest about the help she gave me." Mr Murray added "people like Rebecca give me the confidence to retain my independence".